52.Emoticon & Emoji Keyboard & Photo Graffiti – Chatting on Whatsapp,Twitter,Zoosk Etc. 94.Flappy Pig – Endless touch to fly like a bird! You could get those top game apps for ipod touch here. 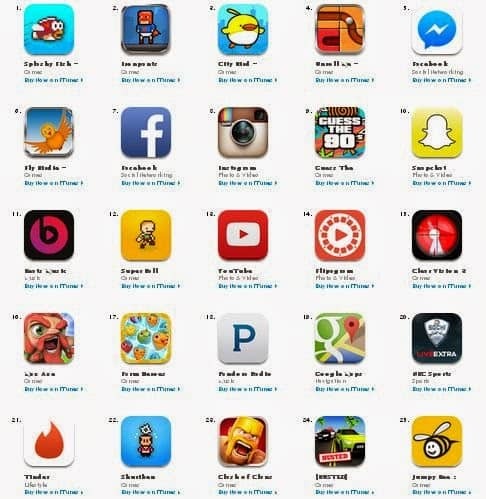 Please see on those list of top 100 ipod touch apps, you will found that about 40 of the best free apps for iphone, ipad and iPod Touch above are in Games category. So if you’re an apps developer and want to sell iPod Touch Apps, consider to develop games app which not yet developed for iPod touch/iPhone, then I believe that your app will get the more chance to become popular and could be listed on those 100 Top Free Apps.